I have a new book out. Actually, it's a new old book. What does that mean? It is one of my former Love Inspired books that was titled Mommy's Hometown Hero. I received my rights back for that book and reissued it. 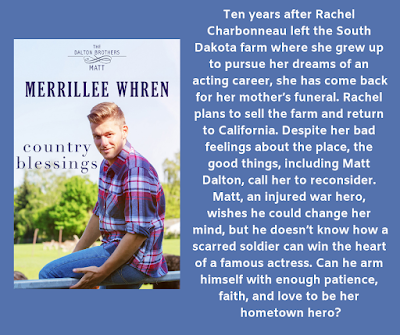 As you can see, I renamed it Country Blessings, because this is the middle book in my Dalton Brothers series. The first book is Four Little Blessings and the third book is Homecoming Blessings. So it seemed logical to put "blessings" in the title of the second book. You may be wondering about the title of my post as well. When movies are made, not everything that is filmed winds up in the movie. The same goes for books. During the editing process, scenes get cut. This book is very dear to my heart because it's set in South Dakota where I was born and where I lived two different times later in my life, from ten to fifteen and again when I was in college. When I first wrote this book, it wasn't long after my mother died suddenly from an accident. In this story my heroine has also lost her mother. Although I never have lived on a farm, my grandparents did. I have many memories of visits to their farm. When I first proposed this book to my editor, she said I could write the story, but my actress couldn't act. That seems a little silly on the surface, but she had her reasons. Focus groups told the publisher that they didn't like heroes or heroines that were actors, artists, or sports figures. Since most of my story was set in South Dakota, far away from Hollywood and my heroine's acting career, I figured I could cut what was necessary to make the book work for Love Inspired. Just for fun I'm going to let you read part of a scene that didn't make the cut. Here it is. He pulled her closer. He didn't want to let her go. Nothing existed except the two of them. He wanted to disappear with her just as it could be done by magic in the movies. But that's what she was doing, making movies, and it was part of her life he'd have to live with. No one could take her place, but he had to share her today and forever. He didn't like the idea. He wanted to brand her with his kiss. Keep her hidden away somewhere. But he knew he was dreaming. He wanted her to himself, but there was always an intrusion like the commotion coming from the other room. “The make-up people are here,” Sarah called. Minutes later, Rachel came out of the bedroom. She wore pants with full legs and wide bottoms. A loose fitting, cream-colored blouse with long sleeves and large shoulder pads completed her costume. Everyone watched transfixed as the make-up artists and hairdresser did their work. When they finished, Rachel looked as if she had stepped straight out of the 1940's. Matt was as much in awe as Erin. He thought of touching her just to see if she were real. “You look like someone else,” he finally said. “That's good. I'm not Rachel anymore. I've been transformed into Amelia.” She twirled around in the small confines of the trailer. “Let's go. You can walk with me to the set.” Rachel headed for the door. They walked across a field where the grass had been trampled flat. Large cables crisscrossed the ground like enormous, black snakes. On the other side of a semitrailer Matt saw an area roped off near a shelterbelt. A crowd had begun to gather—farmers in bib overalls, teenage boys in ball caps, mothers with children in tow—people of every description. Inside the rope, crewmen scurried about setting things up for the scene. As they approached, a murmur went up from the crowd. People with cameras began snapping pictures. In that instant, Matt realized dozens of photo albums would contain a picture of him holding Rachel's hand. So this was what it was like to be a celebrity. Something about it was totally exciting, but something else was equally forbidding. A part of her life would always be open for scrutiny, and his, too, if he chose to share it with her. When they reached an area of chairs also set off by ropes, Rachel stopped. “You guys should sit here. You'll be able to see, but you probably won't be able to hear much.” She gave Becky a hug and Matt a peck on the cheek. Rachel walked toward the large directors' chairs sitting in the field. Ten yards in front of the chairs two cameras were mounted on platforms, sitting on a small railroad track. The track crossed most of the field. Sitting in the chair next to Rachel, Jackson smiled and spoke to her. She leaned over and said something to him in return. Make-up artists and hairdressers did a last minute inspection as the stars sat in their chairs. Matt watched all this with a rising sense of uncertainty. He knew there was no need to be jealous, but at the same time he wanted to be the one talking and smiling with Rachel, not this handsome actor. Rachel and Jackson went to the edge of the shelterbelt. Cameramen manned their stations. The director appeared to be giving final instructions to his stars. Then the man with the familiar black and white clapstick stated the number of the shoot. The sound of the clapstick brought a silence to the crowd. And finally, the director called for action. Again Matt wanted to be in the other man's place as Rachel walked hand in hand with her leading man. They strolled. Then they stopped and talked. The cameras followed the actors' movements as strong-armed men pushed the camera platforms along the track. Five minutes later all action stopped. The two stars took their seats while the director talked with them. Cameras were pushed back to the starting place along the track. Soon they were doing the same scene again. “I hope we see a little more action, especially since we can't hear what they're saying,” Sarah added. There was a consultation amongst all the principals, and then the filming began again. The same thing continued for about an hour until they took a break. “It was interesting, at least the first time,” Matt said, knowing how much he had enjoyed just watching her. Do you like to read about actors or sports figures, or do you prefer to read about people who are more like you? I'll be giving away an ebook copy of the first book in the Dalton Brothers series, Four Little Blessings, to one person who leaves a comment. I will draw the winner on April 15 at 9PM EDT. Very interesting, Merrillee. I could publish entire books on my cut scenes, but I love this excerpt. I prefer to read about people who are more like me. Lori, thanks for stopping by the blog. Lori, you are the winner of the book. Please contact me at merwhren @ gamil dot com. Thank you for sharing this "cut scene," Merrillee, and a bit of info about the story's history. Congratulations on the release of COUNTRY BLESSINGS! Love At First Sight... Can It Really Happen?